Our exclusive ZIP code, 98195 makes Mailing Services a full service post office on campus. Count on us to deliver and collect your mail at least once a day to campus and many off campus locations. 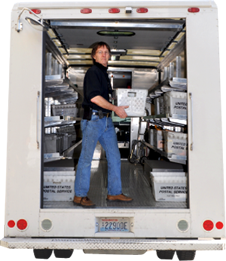 Our efficient box number system ensures that each department receives mail service each day. We are here and happy to serve your needs so please don't hesitate to give us a call or e-mail: for help or to answer your mail or shipping questions.